In Puerto Rico, the survivors of Hurricane Maria are desperately scrambling for many of life's essentials -- food, fuel, water. And cash. Banks are closed or running low on money. Many ATMs are flush out of bills. A week after tragedy struck, at least half of all bank branches are still closed, according to Zoime Alvarez, vice president at the Association of Banks of Puerto Rico. One reason why? There aren't enough drivers to ferry cash around in armored cars to standalone ATMs. "We cannot transport cash to the ATM that's off premise if we don't have enough security to do it," says Alvarez. That's not all. Because of widespread power outages, bank branches are functioning on generators. Banks can't get security software back on line. Bank employees don't have enough gas for their cars to drive to work. There is no public transportation. Banco Popular, a major Puerto Rican bank, told CNNMoney on Wednesday that only 57 of its 169 branches are open for business. And only 150 of its 600 ATMs are operating. "It will take us a while. It's been a big blow," says Ignacio Alvarez, Popular's president and CEO. Here's the thing: Puerto Rico has plenty of currency. It actually has plenty of bills in government facilities. But getting the cash from the storage sites to individual bank branches and ATMs has become extremely difficult. And Popular says it has another problem: finding private security guards who can load machines at supermarkets and other locations not attached to one of their branches. 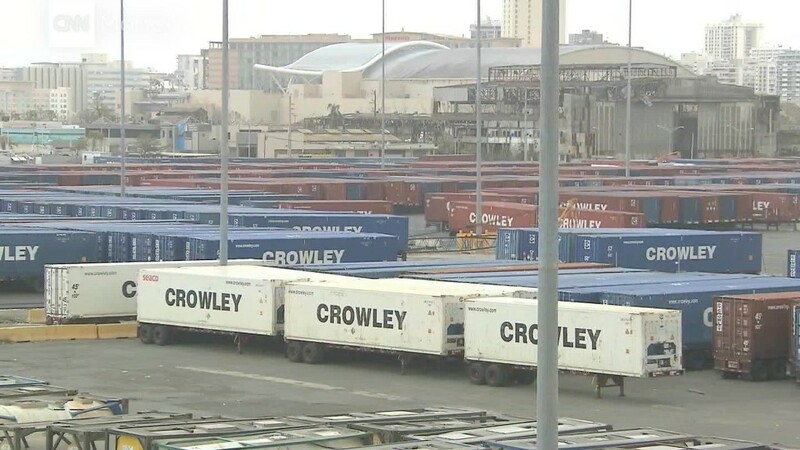 Alvarez, the CEO, said guards have been stretched thin addressing other needs on the island. At the same time, many supermarkets and gas stations are only taking cash because credit card systems are down. The New York Federal Reserve, which provides bills to the island, said Wednesday that "demand for cash is extraordinarily high." Residents are waiting in lines that stretch for blocks from service stations to fill up with gas. Other lines wrap around corners of supermarkets and banks as people try to get food and cash, or both. Natalia Manteiga, a mother of two, waited in line outside a supermarket in Old San Juan on Wednesday, hoping to buy water, tuna and Chef Boyardee meatballs. Her husband had waited several hours in line Tuesday night just to get $20 of gas for the family car. "I don't get my paycheck until Friday so we're getting kind of scared," says Manteiga. "They told me the banks are refilling but we don't know and the lines are very long." Ana Ramos, a retiree, waited four hours in line for $20 of gas on Wednesday, inching her car through a line stretching a few blocks. She teared up as she acknowledged that she'll probably have to wait in line at an ATM in the days to come. "I'm overwhelmed," Ramos said, tears streaming down her face. "I have to wait in line at the ATM because I don't have any more money." 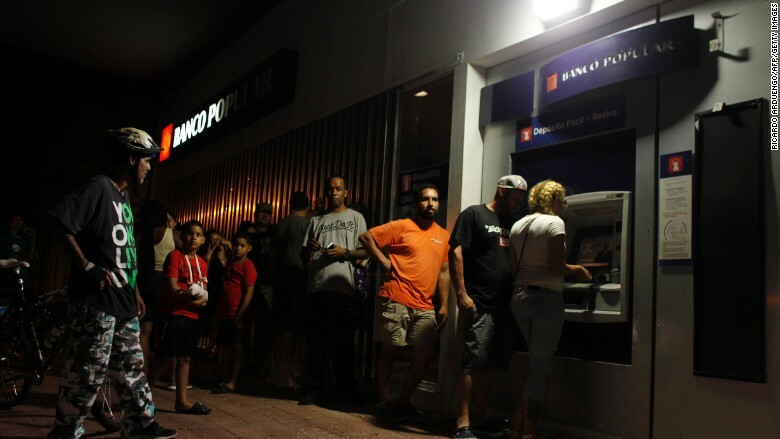 People line up an ATM to withdraw money in San Juan September 25. Banco Santander said it was able to open seven branches, including ones in the south, west and its main location in San Juan. "The bank has enough cash to meet current demand and we're working to open more branches and ATMs soon," said Ann Davis, a spokeswoman for Santander. Unfortunately, people on the island need cash now. Edna Escabi tried to use Santander's two ATMs at San Juan's airport on Tuesday night, where she was stuck because of flight cancellations. No luck: Both ATMs were out of money. She had less than $5 in cash on her. "I'm very upset, very uptight, I've been crying a lot," Escabi, a retiree who lives in Phoenix, Arizona. "Not even a movie could produce what we went through."